How do you make ketchup at home? 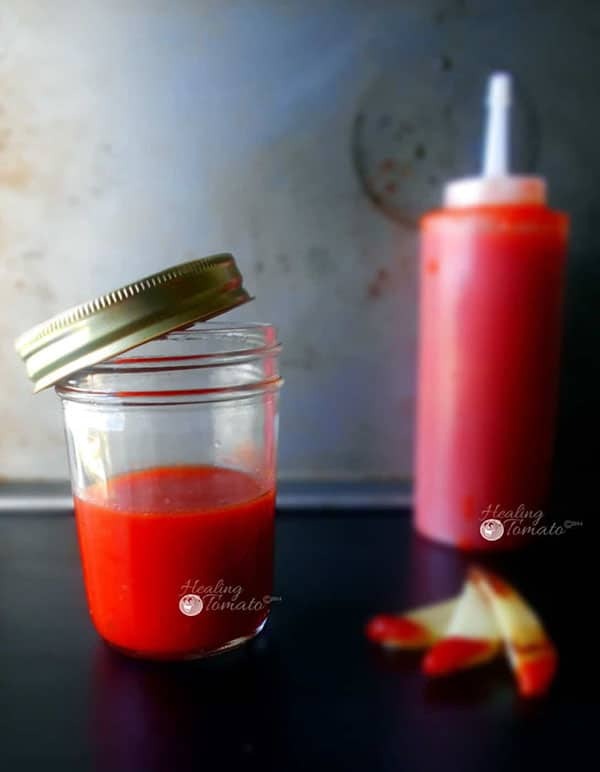 This ketchup recipe is really easy to make and I use fresh tomatoes to make it. Find out the secret ingredient in it. 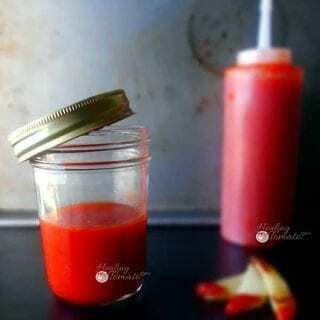 I don’t know why I felt like making a homemade ketchup recipe, but, here it is. Ketchup is easy to find in stores and it isn’t expensive either. “Look, Ma! I made ketchup”. I have always wanted to say that and now I can. Ketchup is so simple to make and has only a few ingredients. I tend to add more ingredients just to keep it interesting. In this recipe, I added Apple Cider Vinegar, fresh tomatoes, roasted red bell pepper and red onions. 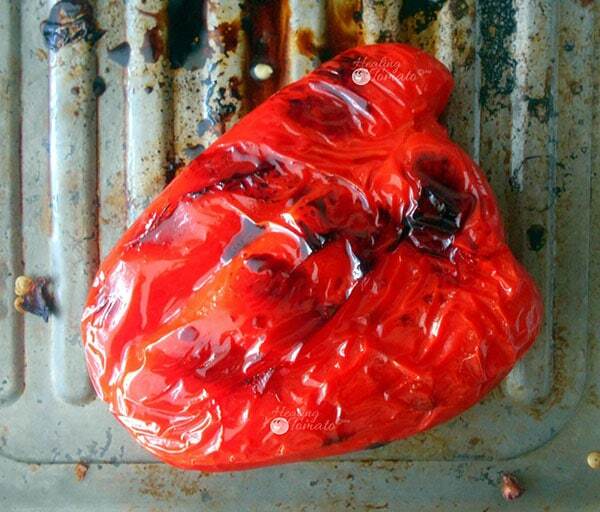 The true hero of this recipe has to be the fresh roasted bell pepper. What a difference it makes! It gave my ketchup a smoky and sweet flavor which is exactly what Ketchup needs. Can you add mayo to make this ketchup? The store bought ketchup has a long shelf life. You can put it in the refrigerator and it will be good for at least a whole year. That sounds good, doesn’t it? On the other hand, my ketchup recipe is homemade and free of preservatives. This means that it has a short shelf life. It tastes so good, so, I normally just eat it up within days. I have found that if I refrigerate this ketchup, it will be good for about 3 weeks. I wouldn’t recommend adding mayo to this ketchup. First, mayo is not vegan, so, its not useful in this recipe. If you use a vegan mayo in this recipe, I still don’t recommend it. Mayo reduces the shelf life of this ketchup. Also, the consistency is going to be on the creamier side. I like the slightly runny texture of my ketchup recipe. When I set out to make this homemade ketchup recipe, I had no idea what I was getting myself into. I had to experiment with various ingredients until I finally got the right ones mixed together. The key here is to use red onions and not yellow onions. Also, I used canned tomato sauce to give it a little thicker consistency. This is not to say that store-bought ketchup is bad or wrong. Once in a while, I would like to try my own version of this condiment. 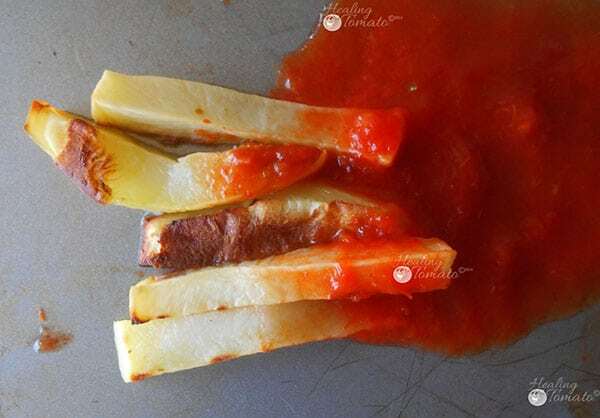 Try this ketchup with my eggplant chips recipe! Or my sweet potato wedges! So, what do you think of “how to make ketchup at home”? Will try making it at home? 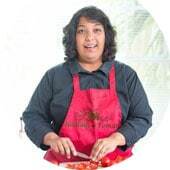 11) For plum tomatoes, cut each tomato into half and squeeze the juice + seeds out. For plum tomatoes, cut each tomato into half and squeeze out the juice + seeds out. 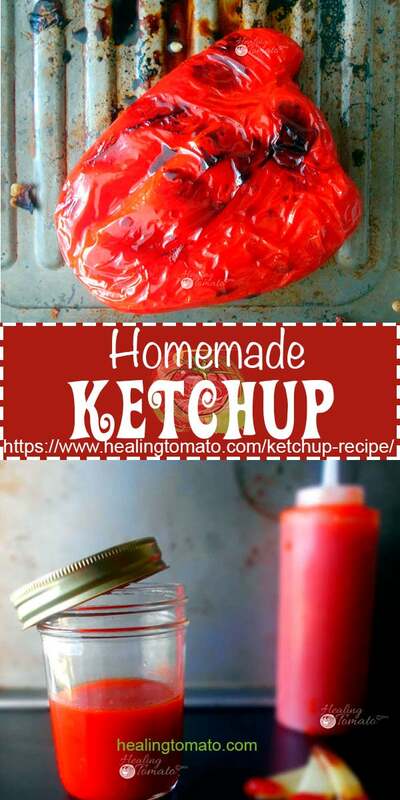 Making your own ketchup is a great idea! There are so many unnecessary ingredients in so many condiments, including ketchup! I’ll have to give your recipe a try! Thank you, Sandra. I appreciate it very much. I’d like to give making my own ketchup a try! I don’t care too much for the store bought varieties, but if you give me a bottle of a gourmet version, I usually like it! Pinning! Thank you, Michelle. I had no idea what was in Ketchup until I looked at the ingredients. I have never made my own ketchup. I am intrigued and would like to try this! Thanks for posting! I’ve made my own ketchup for a few years now. Once you taste how fresh it is homemade, you can’t go back. I even did a ketchup tasting party once last year. I can’t wait to try your recipe. It looks great! Thanks for sharing it. Thank you, Debi! I know what you mean. Now, I am probably not going to buy my own ketchup. Wow, I had no idea how easy it could be to make my own ketchup. You are wonderful Rini!! There must be something in the air (or we all just have way too many tomatoes harvested)– Kerry just posted a ketchup recipe on our blog today too! I like that yours has roasted red pepper in it- I bet that makes it taste very delicious! Thank you, Jamie. I have to tell you that the roasted pepper was the best thing in this recipe. Without it, the Ketchup would not even have been half as good. Thank you Ellen. Sriracha is great idea. I have it on my list but haven’t gotten around to it.